I was introduced to TOMS Shoes about a year ago and was very impressed by what they are doing. Blake Mycoskie founded the company in 2006 after traveling in Argentina and noticing all of the children who had no shoes. He wanted to help out, and TOMS Shoes was the outcome. For every pair you purchase they will match it by donating a pair of their shoes to a child who has none. Their one for one model is starting to be adopted by other companies who want to make a difference in the world. TOMS has distributed over 150,000 shoes to children all over the world, and plans to give an additional 300,000 by the end of 2009. Basically what I am getting at is when you spend your money on TOMS Shoes you can feel really good about what you are doing. Now that you are all inspired and want to help kids get shoes around the world, let me tell you another reason you should buy a pair or two. They are actually pretty rad surf shoes. They are very simple, slip on shoes. There is very little fabric at all, so it’s basically like a slipper you’d wear around the house, except it has a durable sole. These kinds of shoes are perfect for surfers to wear to and from the beach. I also think they get more comfortable as you wear them in over time, so taking them to the beach is the perfect way to get that done. There are a ton of different styles…literally, tons of them, so you can definitely find a pair that you will like. 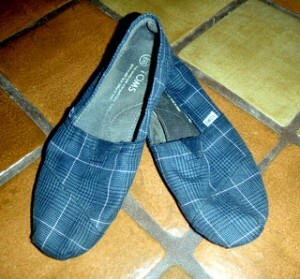 They recently came out with a new model of TOMS as well that has laces and looks pretty stylish. Most of the shoes cost around $44, with some of the newer models being a bit more expensive, but remember that you are paying for two pairs each time you buy yourself a pair. I really appreciate companies doing things like this to help others, it’s definitely a passion of mine, and I look up to TOMS for what they are doing. But I have to say, even if they weren’t centered on giving to others, I would probably end up getting a pair anyways, because I really do think they make great surf shoes.